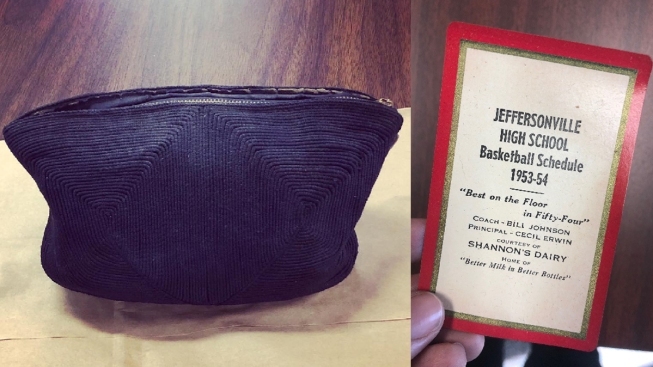 A Jeffersonville High School basketball schedule from 1954, lipstick and a letter asking her to prom were found inside the bag. This purse, seen along with a card found inside, was found in an Indiana elementary school after being missing for more than 65 years. A purse missing for more than 65 years was found in an Indiana elementary school during renovations, NBC affiliate WAVE 3 reports. The small black purse was found in part of the old Jeffersonville High School building on Court Avenue in Jeffersonville, the news outlet reported. An ID for Martha Ina Ingham was found inside the purse. A Jeffersonville High School basketball schedule from 1954, lipstick and a letter asking her to prom were also found inside the bag. “I’ve heard that Paul has asked you to go to the Prom with him. If he hasn’t, I would like very much to take you,” read part of one letter that was found in the purse. Wave 3 reported that the school district used social media to track Ingham down.